February 25, 2016 By This post may contain affiliate links. 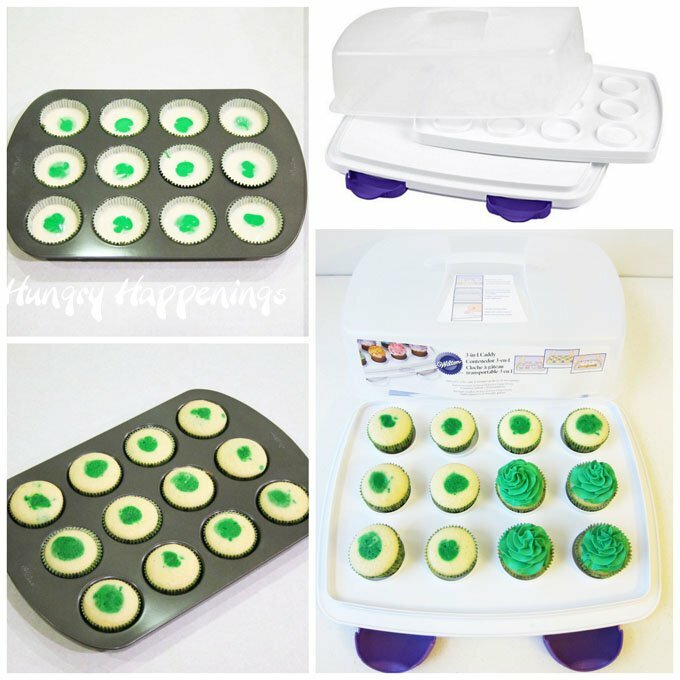 This St. Patrick’s Day decorate Oreo Cookies and use them to create adorably cute Leprechaun Cupcakes. 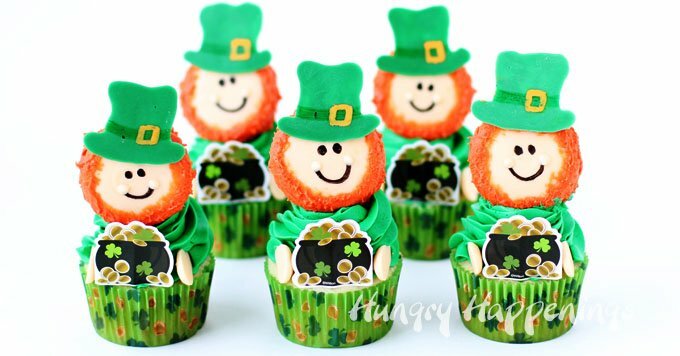 Each little leprechaun sits atop a big swirl of green frosting and happily holds a pot of gold. Over the past year, I’ve been making cupcakes topped with bears, puppies, monkeys and even lions made using Reese’s Cups. Each of those animals sits atop a big swirl of frosting and has it’s arms wrapped around a piece of candy. I love this design concept and wanted to use it to make St. Patrick’s Day cupcakes but didn’t want to use a chocolate peanut butter cup. Instead, I chose to dip Oreo Cookies into peach colored candy melts and turn them into Leprechauns. Admittedly, these Leprechauns do require a bit more work than the Reese’s Cup animals did. First you need to dip the Oreo, then add a beard and face. The leprechauns also need hats and hands which are also handmade. 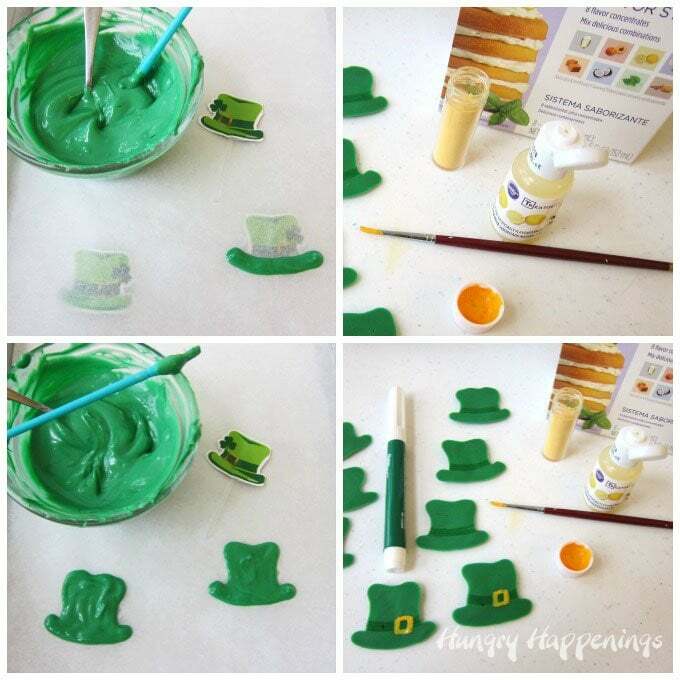 I decided each leprechaun would hold a pot of gold and I took the easy route and used the paper cupcake sticks that came in a package of Wilton St. Patrick’s Day cupcake liners. Your leprechauns could also hold a chocolate gold coin. Or you can make chocolate pots filled with gold candy pearls. 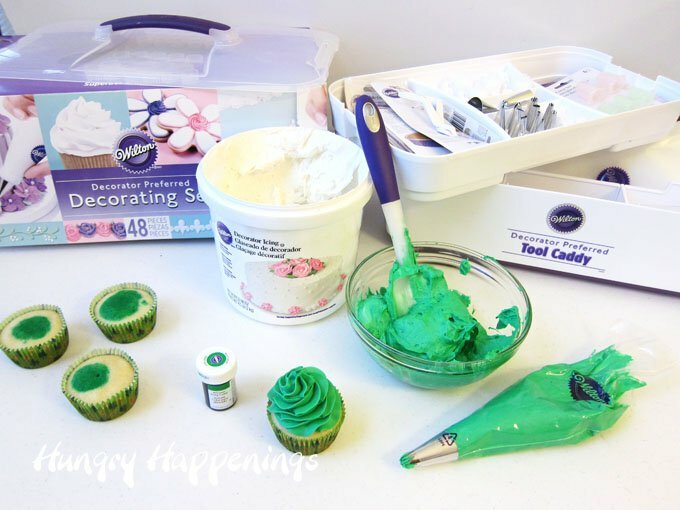 Wilton has all sorts of fun cupcake kits and the St. Patrick’s day kit comes with cupcake liners, pot of gold picks and hat picks. I tried using a hat pick and poked it into one of the Oreos but it looked funny poking out from on top of the Leprechaun’s head, so I opted to make candy hats instead. I also tried out a Wilton Two-Tone Cupcake Pan and Insert to add a little surprise inside each cupcake. You make your cupcake batter, then color 1/3rd of it (in this case, green) and pipe that into the center of the insert and pipe another color (in this case, white) around the outside. When you’ve filled 3 cupcakes, you simply lift up the insert, place it into the next set of cupcake liners and pipe in the batter. You don’t have to clean the insert off unless you change colors. I tested out Wilton’s Perfect Fill tip to pipe in the green coloring. You put it into a disposable pastry bag just like a coupler, then pipe the batter into the pan. It fits perfectly into the two-tone insert and when lifted up doesn’t allow the excess batter to spill out. In contrast my bag of white cake batter made a mess all over my counter as the batter oozed out every time I set it down. The Perfect Fill tip would be great for making pancakes. I need to get a few more. Once baked, the exterior of the cupcake looks white but when you take a bite, you see the surprise color hiding inside. I thought white and green made the great combo for St. Patrick’s Day, but I look forward to trying out all sorts of color combinations in my new pan. The cupcakes are baked as usual and must be cooled completely before frosting. I made my cupcakes in the evening and didn’t plan to decorate them until the next day, so I stored them in Wilton’s 3-in-1 Cupcake Caddy and Carrier. It’s the perfect size for 12 large cupcakes or 24 minis. It’s even large enough to hold a 9×13 cake. It has a fairly airtight seal to keep your cupcakes fresh so you can store them in there for a few days. Once you have a batch of cupcakes made, you need to make some leprechauns. 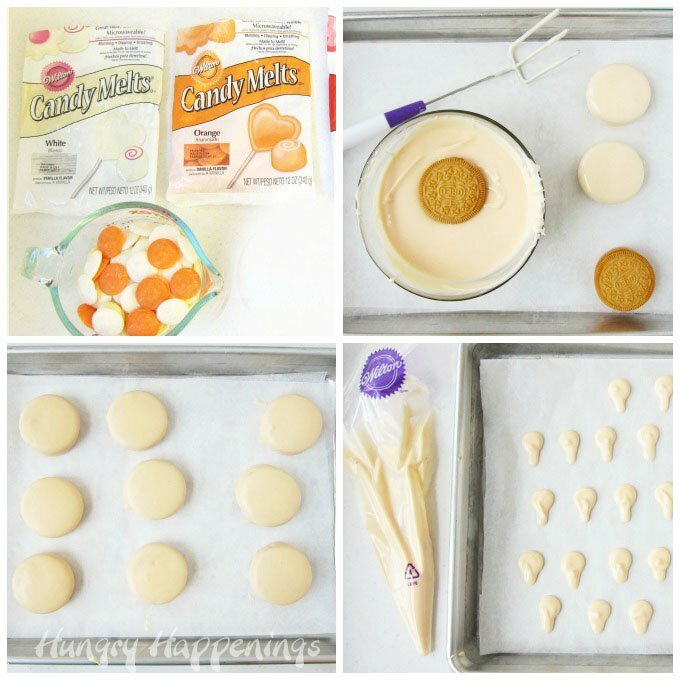 Start by melting one 12 ounce bag of white candy melts with 10 orange candy melt wafers. That will give you a nice peach color. Dip any type of Oreo Cookie you like into the peach colored candy coating. I had some Pumpkin Spice Oreos, so I used those. Use a dipping fork or kitchen fork to lift the cookie out of the candy melts and allow the excess to drip off before placing it on a parchment paper lined baking sheet. Freeze for 5-8 minutes until the candy coating hardens. You’ll also need two small peach colored hands for each leprechaun cupcake. Pipe tear drops shapes onto a parchment paper lined baking sheet then pop them in the freezer for a few minutes. You’ll also need to melt some green candy melts to use to make the leprechauns’ hats. I used the leprechaun picks that came with the St. Patrick’s Day cupcake kit as a guide. I pulled the sticks out of the paper hats and set them under a piece of parchment paper. I then piped around the outside of the hat, making my hats a wee bit bigger than the paper picks. If you don’t have the picks, draw out a simple hat shape and set it under your parchment paper, then pipe the green candy melts over top. Pop them in the freezer for about 3 minutes until the candy hardens. Then remove them and allow them to warm up to room temperature. Use a Wilton Green Candy Decorating Pen to draw a band on each hat. Then mix a bit of edible Wilton Gold Pearl Dust with some lemon extract or vodka. I used Wilton’s Sweet Meyer Lemon flavoring from their Treatology System. Use a food use only paint brush to paint a gold buckle onto each hat. To decorate the leprechaun Oreos you’ll need red or orange candy melts or a combo of both, which is what I used. You’ll also need a food use only paint brush with wide bristles. Dab the melted candy melts around the edge of the Oreo cookie. Once the candy starts to thicken, push your brush up against the edge and quickly pull away creating small little spikes. This will give your leprechaun’s beard and hair some texture. Then use a black candy marker to draw on two eyes and a smile. Add a dab of peach candy coating at each end of the smile if you’d like them to have cheeks. 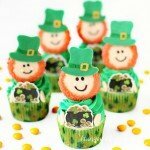 One of my readers commented that she had a hard time getting her Reese’s Cups Teddy Bears to stand up straight on her cupcakes, so I thought it might be helpful to add a candy pick to each Leprechaun Cookie. To create a candy pick, simply pipe some candy melts onto parchment paper and set the Oreo Leprechaun over top. Allow the candy to harden before peeling it off the parchment. 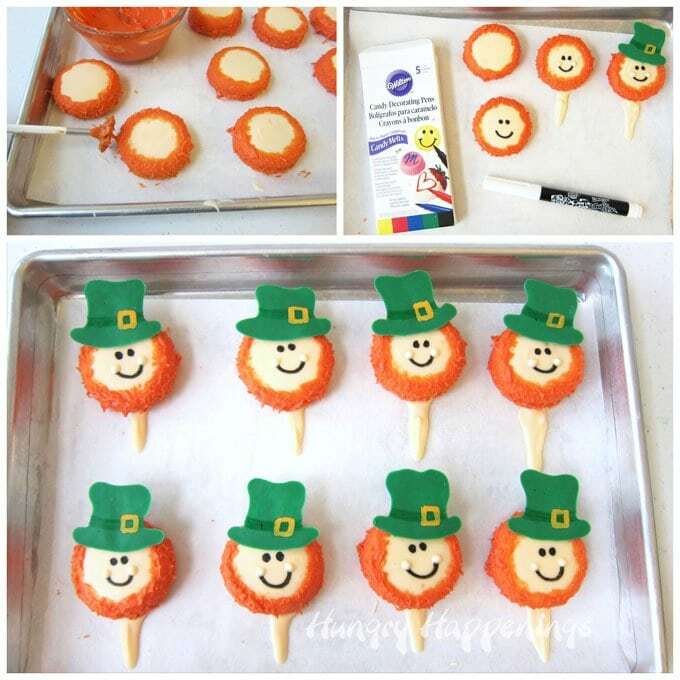 Attach one candy hat to each Leprechaun cookie using either peach or green candy melts. Now you need to add a big swirl of sturdy green frosting on top of each cupcake. I used Wilton’s Decorator Icing and colored it using their Kelly green icing coloring. I absolutely love this frosting. It’s the perfect consistency for piping big swirls of frosting onto cupcakes and it tastes great. 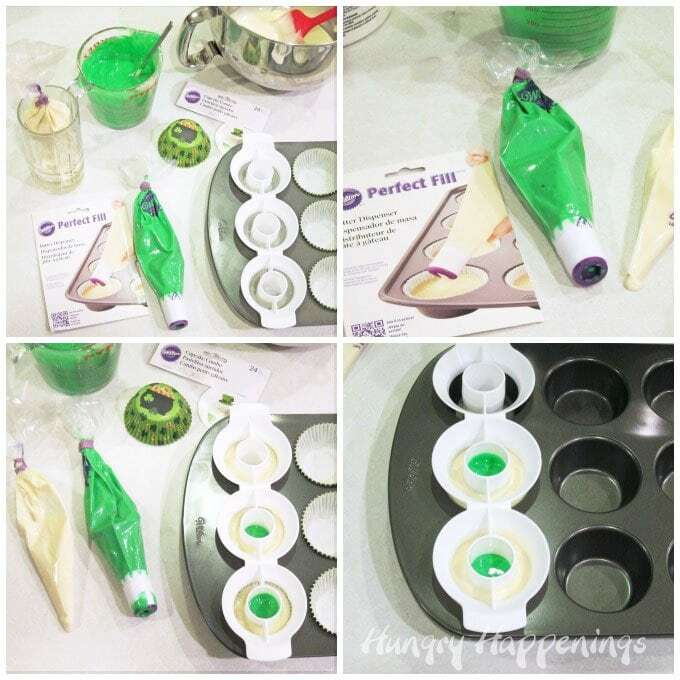 To make the swirls, spoon some of the green frosting into a pastry bag fitted with a big star (1M) tip, then pipe a big swirl in the center of each cupcake. Now all you have to do is assemble the cupcakes. 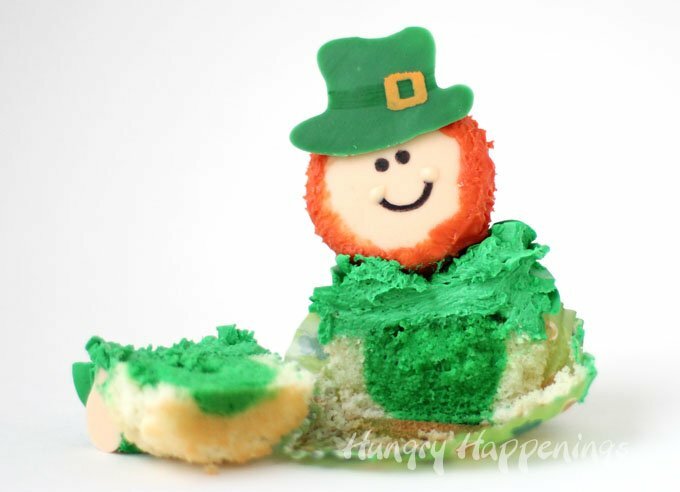 Attach one Leprechaun cookie to the top of each swirl of frosting. Insert a pot of gold pick into the front of each cupcake or attach a gold chocolate coin. Then press a candy hand on either side. Your Leprechaun Cupcakes are ready to serve. They look great in Wilton’s Display Your Way Adjustable Cupcake Tower. This unique display can showcase as few as 5 cupcakes and up to 25. Mine had 9. Cute St. Patrick's Day cupcakes decorated with Oreo Leprechauns. Pour white and orange candy melts in a microwave safe bowl. Heat on high power for 15-30 second increments, stirring after each until melted creating a peach color. Dip Oreo in peach colored candy melts. Remove using a dipping fork and allow excess candy coating to drip off. Set on parchment paper lined baking sheet. Freeze for 5-8 minutes until candy coating hardens. Pipe 32 small tear drops onto parchment paper for the hands. Pipe or paint the candy melts onto parchment in the shape of a leprechaun hat. Freeze for 3-5 minutes until hardened. Use the green candy decorating marker to draw a band onto each hat. Brush it onto each hat creating a buckle. Paint a 1/4 inch wide border all around each cookie creating the hair and beard. Draw eyes and a smile onto each cookie. Add dots of peach candy coating at each end of the smile. Attach one hat to each cookie using candy melts. 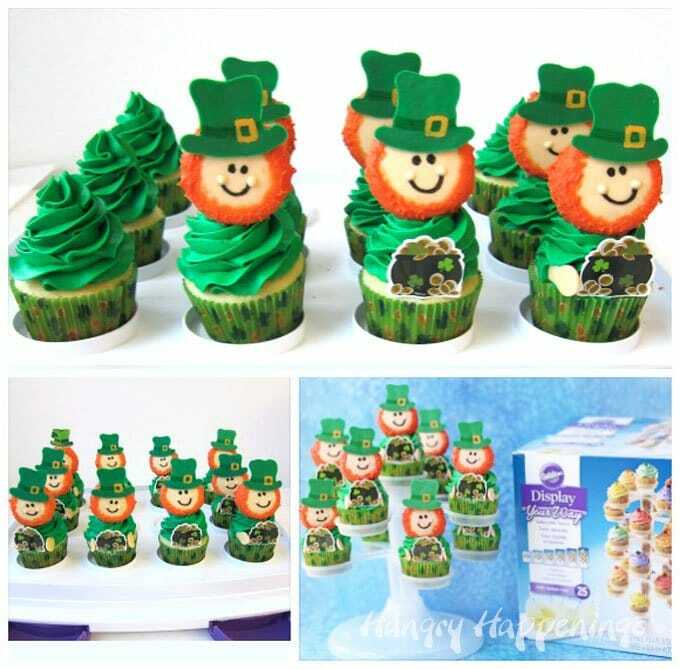 Attach one Leprechaun cookies to the top of the swirl on each cupcake. 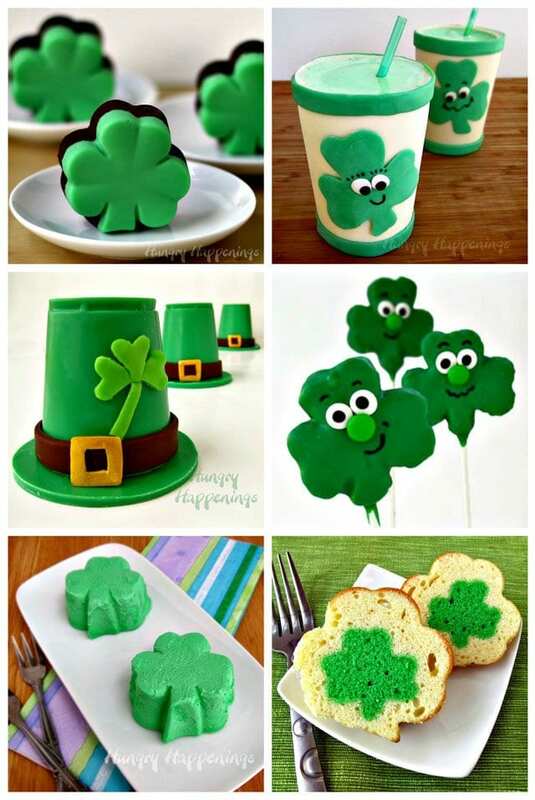 Insert a pot of gold pick or attach a gold coin or shamrock candy to the front of each cupcake. Insert two hands into the frosting so they look like they are holding the pot of gold. I was compensated by Wilton to share this tutorial with you today. All opinions expressed here are my own. My biggest problem is maintaining my patience to see the job all the way through! I have the most trouble with finding diabetic-friendly desserts to bake. I have the most trouble cleaning up after baking. I have the most trouble with the small details in baking/candy marking. Either small icing details, cookie borders, or chocolate/candy melt designs, it is all still a work in progress. I’ve got quite a ways to go to fill my mothers shoes in the baking kitchen! I love, love your site and I follow you everywhere. You are so creative and your desserts or food are fun to make, You explain very well and step by step how to replicate your work. Thank you so much. Lucky to say that I really don’t have any trouble with baking or candy coating except maybe eating more of the candy coating with a spoon instead of what I’m dipping. A sourdough bread with a hard crust. I have the most problem with having enough time to do everything I want and enough space to do it in! Your posts are always so delightful and ingenious. I would have never suspected the leprechaun was made from an oreo. My biggest problem is melting chocolate bits evenly so they don’t end up scorched. I am not a great baker from scratch so my problem is when a boxed mix or recipe doesn’t come out right I don’t know what to do to correct it! Biggest problem is I want to bake EVERYTHING at once, even if I don’t have orders! Don’t make candies, although I do use the Wilton melting chocolates for a couple of different items. Thanks for the chance at this giveaway! Beth, you always have THE cutest ideas, I just wish I could have time to do all of them. I have the most trouble finding sugar free chocolate to melt! Guittard makes a good sugar free chocolate. It can be used to make fillings, ganache, to dip and to mold! Guittard makes really good products. I’ve not tried their sugar free chocolate yet. I’m glad to know it’s good. I’ll have to give it a try. Thanks for the suggestion. These cupcakes turned out super cute! I would say my biggest problem is working with chocolate /melting candies in a warm environment. i live near Phoenix, AZ which means half of the year my home is too warm. But my small fridge is too full to put a sheet pan of treats in it. I really have to plan ahead. Beth, looking at the pic I just couldn’t fathom what that little man was made of. An oreo! Genius!